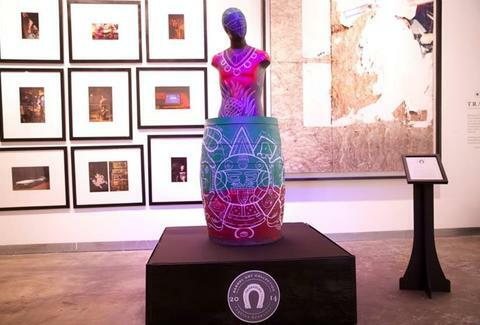 We got together with Tequila Herradura to challenge ten Atlanta artists to turn tequila barrels into masterpieces for the Tequila Herradura Barrel Art Collection 2014. In case you missed the showcase, they've now placed five of these amazing structures at bars all over Atlanta and beyond -- and, to sweeten the deal, they're offering specialty cocktails at each location. Hit one or all of these spots between November 11th and December 8,grab a refined adult beverage, and catch some of the tastiest art ever made (because, you know, it's made of tequila barrels). Specialty Cocktail: Skinny Margarita or three dollars off a shot of Herradura Silver. Specialty Cocktail: PURE Double Barrel Margarita with Herradura Double Barrel Reposado tequila, agave nectar, lime juice, and Combier orange liqueur. Specialty Cocktail: Skinny Margarita or two dollars off a shot of Herradura Silver. Specialty Cocktail: Organic Margarita with Herradura Silver Tequila or Herradura Silver chilled shots.